The slurry needed for the production of licorice is prepared in a mixing tank. 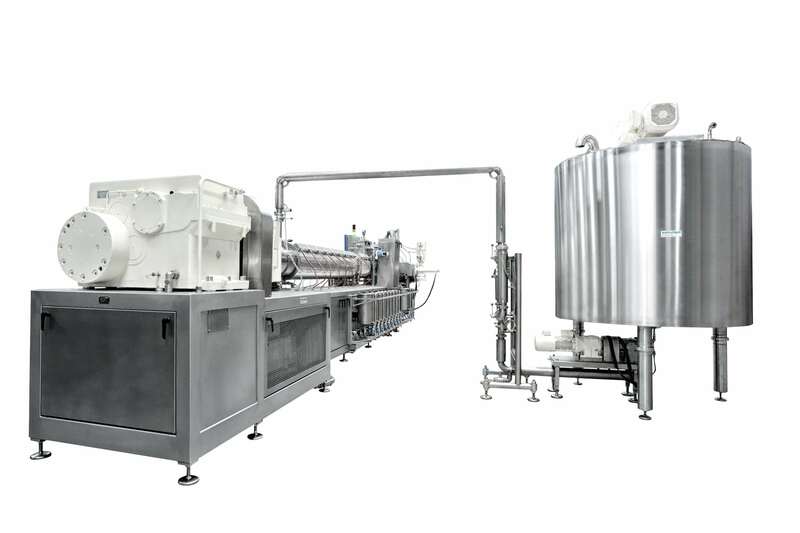 Here, the ingredients are mixed into a homogeneous mass by two counter rotating agitators. The slurry is then transferred to the extruder by a pump in order to obtain a continuous feed to the cooking extruder. Since most mixing installations are set up to work on one batch at a time, and because the extruder needs continuous feeding, the use of a storage tank (day tank) is recommended. Usually, a day tank holds twice the volume of a mixing tank. This allows the manufacturing of batch after batch, which is then pumped into the day tank in order to provide a buffer and continuous supply to the extruder. The water heated day tank consists of a jacketed vessel with an inspection opening, an agitator, and level indicators. Lastly, the double filter station can be easily switched and cleaned during operations.